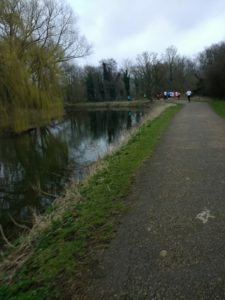 Last year I did the half marathon (with my Dad, it was great), but they also offer a 10k which starts a bit earlier (always my preference) and I could not decide which one to do, so I left the decision until after running Cambridge. 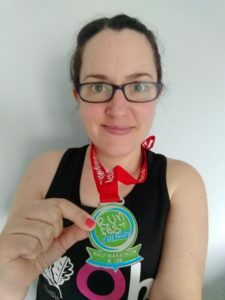 I was pretty tired all that week, I picked up a cough which mostly affected me at night, and I was ill one weekend so I decided that the 10k was the most sensible option. 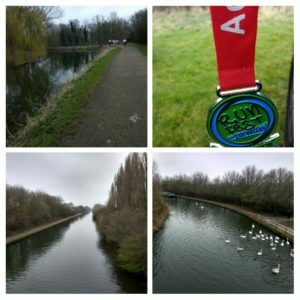 The half marathon is a two lap course with the 10k being one lap (slight deviations in both cases as a half isn’t double a 10k), so I thought at least I would see all the pretty scenery. I was more worried about driving there than the run- I was up early to have a piece of toast and some nuun in water, and had plenty of time to drive and park. The journey was actually fine and I had plenty of time to collect my number, use the toilets (there are real toilets as there is a cafe on site) and chat to a few running friends. I took my jacket off and tied it around my waist so I was just wearing my vest, but it was really cold. The start was delayed by 15 mins due to queues inside, which I didn’t realise until I’d been waiting for 10 mins, so I got quite cold stood around, but soon we were off and running around the park. I wasn’t going for a pb, but I wanted to push the pace a bit. I’m not good at racing 10k’s as I think I should be able to go faster but I hate that feeling of pushing hard. I was aiming to get in the low 9 min per mile, and ended up hovering around that mark (9.25 as the first mile was quite congested, then 8.59, 9.02, 9.04, 8.56, 8.52 and then 8.01 for the final bit) which I was pleased with. 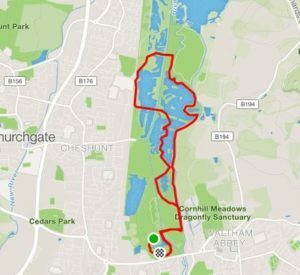 The route is pretty flat apart from some bridges that you run over- some of them are fairly gentle but some are pretty steep so a bit tough when you are trying to run fast. 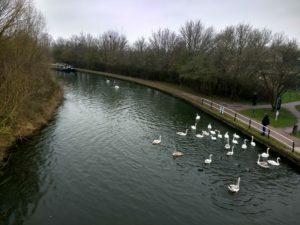 At times the route curved around and so up ahead I could see runners and then their colourful tops reflected in the waterways. I tried to take some mid-run photos but I didn’t want to slow down too much! At one point I caught up with a runner from our club so chatted to her briefly, and then later I was overtaken by one of the speedy runners from our club- she’d started right at the back so had been working her way up the field for the whole race. I wondered if we would see any half marathon runners, but as the routes were a tiny bit different we didn’t end up getting lapped. The finish felt long- you run through the field where the cars were parked, over a bridge and then down towards the main centre- everyone was saying “nearly there, final push” but then you seemed to go away from the finish a bit, veering around the building and through a small car park. I think I started my “sprint” finish too early. As I finished I got given a medal and picked up a bottle of water and a banana. I suddenly felt really hungry, but then that piece of toast was a long time ago. I chatted to the runners who had finished ahead, and we waited for the others to come in. After a team photo we all headed home. On the way back there is a big retail park with a Starbucks in it, so I decided to stop and get a cinnamon roll and a chai latte as a sort of brunch as otherwise it would be a 30 min + journey and time was getting on. When I got home I had a lovely hot shower and then looked up my results. My chip time was 56:23 so I am pretty pleased with that. 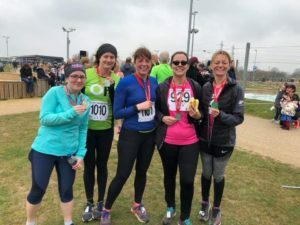 All in all a good race, although I think next year I might do the half marathon there as I did really enjoy the route and it seemed to finish really quickly this year. It would be such a good place to go for a walk too, as there are paths everywhere and lots of spots for picnics and things too. Do you like lapped routes? Are you good at driving to new places? I was more nervous about the journey than the actual race! Well done, a good time and it sounds like you ran it the way you wanted to, which is always a good feeling 😊. I quite like two lap races but not keen on more than that- I forget where I am in the race! Yes, I think any more than two laps makes things feel longer (even parkruns). Well done on the race! Good call about doing the 10k rather than the half if you weren’t feeling your best. I’m like you and don’t really know how to pace a 10k and hate running them hard. Just a bit too long to be on the pain train for! I think that’s it with a 10k, if you are not feeling ultra trained then it’s fine as you know you can run it and enjoy it, but to actually race it’s too hard for too long!